「숙종어필 칠언시(肅宗御筆 七言詩)」는 숙종(肅宗, 1661~1720)이 인조 때의 명상(名相)이던 이경석(李景奭, 1595~1671)의 문집 『백헌집(白軒集)』을 살펴본 뒤 이경석 후손에게 내려준 어제어필의 칠언시이다. 현재까지 알려진 묵적(墨蹟)의 숙종어필 가운데 가장 신빙할 만한 예로서 채색꽃무늬를 찍은 어찰지(御札紙)를 사용한 이 어제어필은 열성어제(列聖御製)인 『숙종어제(肅宗御製)』에도 실려 있어 어필 자료로서 가치가 높다. 전서(篆書)로 ‘숙종성제보묵(肅宗聖製寶墨)’ 이라고 음각한 갑(匣)에 보관하고 있으며 보존상태도 양호하다. 이경석이 1668년 11월에 현종(顯宗)으로부터 하사받은 궤장(几杖) 및 그것을 받았을 때의 잔치 장면을 묘사한 「사궤장연회도첩(賜几杖宴會圖帖)」(보물 제930호)과 더불어 의미 있는 필적이다. This seven-word poem by Yi Gyeong-seok (1595-1671), a prominent courtier during King Injo’s reign, was written in the hand of King Sukjong (1661-1720). Sukjong is said to have written it, after leaving through Yi Gyeong-seok’s collected works, ‘Baekheonjip (Collected Works of Baekheon),’ and gifted it to the latter’s descendants. This is the most likely to be an authentic handwriting in ink on paper of Sukjong, of all writing samples thus far discovered and attributed to him. 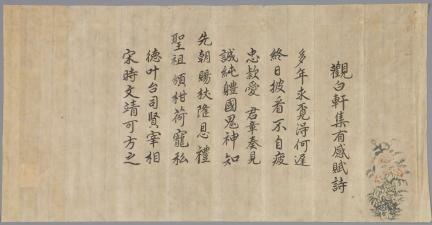 This poem written on a letter sheet used by kings, stamped with color floral designs, appears also in ‘Sukjongeoje (Writings of King Sukjong),’ and is considered an invaluable relic. 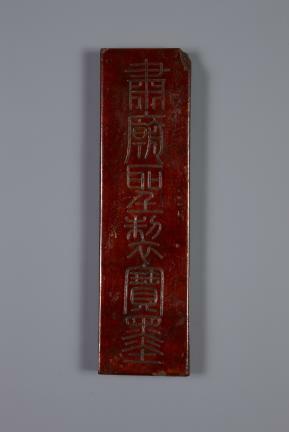 The poem is written in seal script and has been stored in a case bearing the inscription “Sukjongseongjaebomuk (Ink writing sample of King Sukjong).” The state of preservation is overall good. 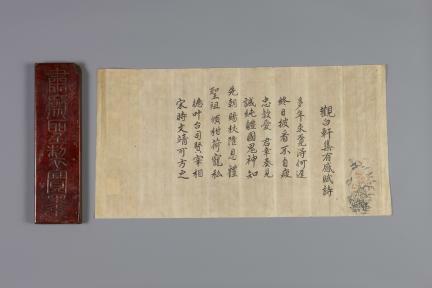 This writing sample of Sukjong is associated with other relics associated with Yi Gyeong-seok, such as the arm-rest and walking staff bestowed upon him by King Hyeonjong, in November 1668, and ‘Sagwejangyeonhoedocheop (‘Album of Paintings on the Banquet on the Occasion of the King’s Bestowal of Arm-Rest and Walking Staff’; Treasure No. 930), consisting of paintings documenting the scene of the banquet hosted on this occasion.